There is no guarantee you will be more productive if you adopt a to-do list app like Remember the Milk, but your chance of being more productive will even smaller if you don’t organize the tasks you have to get done. 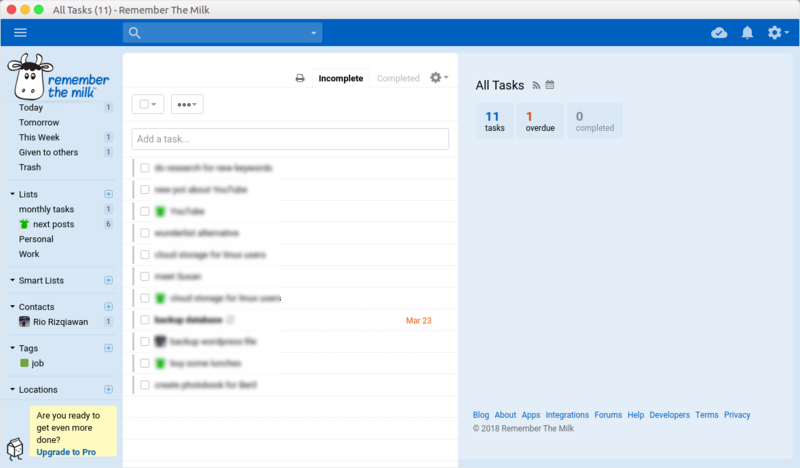 Remember the Milk is a worth-trying to-do list app to allow you organizing all the tasks you have to get done. It is available for all platforms, including Linux. It’s rare enough to see a to-do list app that provides a Linux version. Wunderlist, Todoist, Any.do. They all don’t provide a Linux version, so what Remember the Milk did is really worth to appreciate. The Linux version of Remember the Milk is pretty similar to the web version. Hardly any difference. Everything you can do on the web version of Remember the Milk, can also be done on the Linux version. 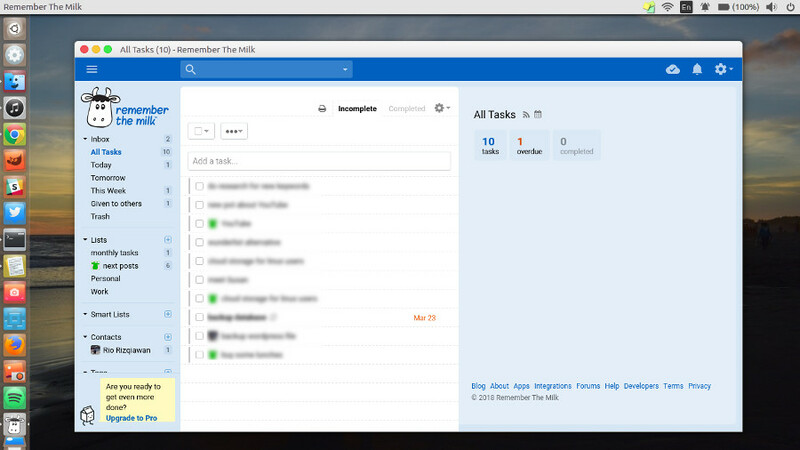 You can add new tasks, mark the finished tasks, assign a task to someone and so on. All the features on the web are also be brought to Linux version. If you use Linux on your daily basis, Remember the Milk is definitely a great tool to help your tasks be more organized. The Linux version of Remember the Milk is available in two versions: deb and rpm. Each version is available for both architectures, be it 32-bit or 64-bit. Here is the glance look of Linux version of Remember the Milk. To install Remember the Milk in Linux first you need to download binary package on its official site. Select the package based on the Linux distro you as well as your computer architecture. Once you are done downloading the file, follow the steps below to install. Go to the directory where the .deb package of Remember the Milk is located using cdcommand and run the following command. Don’t forget to tailor the package name. Go to the directory where the .rpm package of Remember the Milk is located using cdcommand and login as root by typing suon the terminal, then run the following command. Don’t forget to tailor the package name. If you are new to Remember the Milk, we have covered it in this article.